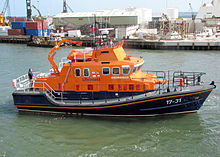 At 17 metres lang, the Severn-class lifeboats are the lairgest class o UK lifeboat. A boat is a wattercraft o ony size designed tae float or plane, tae wirk or travel on watter. For smaa boats, this is typically inland (lochs) or in pertectit coastal auries. However, boats such as the whaulboat wur designed tae be operatit frae a ship in an affshore environment. In naval terms, a boat is a vessel smaa enough tae be carried aboard anither vessel (a ship). Anither less restrictive defineetion is a vessel that can be liftit oot o the watter. Some defineetions dae nae mak a distinction in size, as 1000-fit bulk freichters on the Great Lochs are cried oreboats. Boats come in a wide variety o shapes, sizes an construction due tae intendit purpose, available materials an local tradeetions. Canoe type boats hae a lang history an various versions are uised throughout the warld for transportation, fishin or sport. Fishin boats vary widely in style partly tae match local condeetions. Pleasur boats represent a less practical approach, includin ski boats, pontoon boats, sailboats. Hoose boats mey be a vacation or provide lang-term hoosin. Smaa boats an aa provide transport or move cargo (lichterin) frae lairge ships. Lifeboats are an important safety measur. This page wis last eeditit on 25 Mairch 2015, at 05:26.